Mango is one of the most delicious fruit which is nutritionally rich with unique flavor, fragrance, and taste. Outer skin of mango is smooth and is green in un-ripe mangoes but turns into golden yellow, bright yellow or orange-red when ripen depending on the cultivar. Internally, the fruit has juicy flesh with orange-yellow color. Mango fruit tastes sweet with mild tartness. They are usually consumed raw and also used in making shakes, pickles, sauces, ice-creams and smoothies. Being a rich source of antioxidants, mangoes are very helpful to get healthy and glowing skin. Mangoes are considered very effective to protect from cancer, cataract and prevent from early signs of ageing. Due to its several health and beauty benefits, mango is also known as “King of Fruit”. 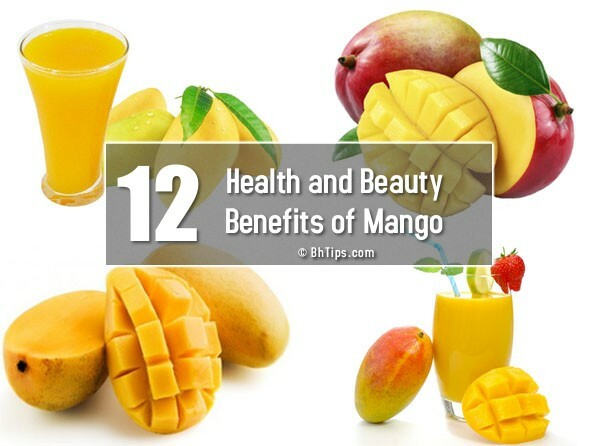 Let's have a look on best health and beauty benefits of mango. Rich amounts of vitamin C and vitamin A in mangoes, plus 25 different kinds of carotenoids enhance your immune system and make it strong. Mangoes also increase immunity to fight common diseases like cold, flu and infections. Mango contains a good amount of dietary fiber which makes it bulk laxative. Thus it improves digestion and prevents constipation. Mangoes help to promote regularity and maintain good digestive health. High quantities of fiber can be found in mangoes, which aid the body in getting rid of waste. One mango provides approximately 20 percent of the daily required fiber intake. Potassium is another helpful nutrient for digestion that can be found in mangoes. Potassium deficiency has been linked to constipation and imbalances of fluid in the body.Mango contains enzymes that increase the breakdown of carbohydrate and protein. So it is effective to increase the energy level. Recent scientific research has shown antioxidant compounds in mango fruit have been found to protect against breast, colon, leukemia, prostate and skin cancers. These antioxidants are quercetin, isoquercitrin, astragalin, fisetin, gallic acid and methylgallat. Even Vitamin-A and flavonoids like beta-carotene, alpha-carotene, and beta-cryptoxanthin present in mango prevents lung and oral cancer. Antioxidants help in protection against harmful free radicals and suppress the oxidation process. Mango is a rich source of dietary fibre and contains pectin which restricts the action of a protein called Galectin 9, known to trigger the cancer cell growth. This helps in lowering the onset of various kinds of cancers. Mangoes contain a good amount of fibre, pectin and Vitamin C which helps to lower serum cholesterol levels and that too LDL (low density lipoprotein) cholesterol which is also known as the bad cholesterol. Mangoes contain rich amount of Vitamin B-6, for maintaining and improving the brain functions. It helps in maintaining an efficient nervous system. It is a mood vitamin and enhances mood and controls stress. It is known as the energy builder and helps in building the communication between nerve cells.Mangos are also rich in glutamine, an essential amino acid, which has shown to enhance concentration and memory. Mangoes are rich in Vitamin E and C. Both Vitamins are essential for healthy and youthful skin. Vitamin C fight against skin damaging free radicals and Vitamin E prevent premature wrinkles and slow down aging process. Mango contain a good amount of iron which plays an important role in production of red blood cells. Mango is the richest source of minerals and nutrients like copper, manganese, magnesium, zinc and folates. These nutrients increase the production of RBC cell. Mngo also contains Vitamin C that increases iron absorbing capacity of the body. So mango is very effective and beneficial for people suffering from anemia and help a lot to protect from anemia by increasing blood production. Mango is the rich source of potassium. Potassium is important to maintain the sodium level. Thus it regulates the fluid level in the body. It helps to control blood pressure and heart beat. So mango is beneficial to protect from stroke and heart attack. Vitamin-A or Retinol in mango helps a lot in promoting eye health. Night blindness and eye dryness can be prevented by its intake. Mangoes increases eye vision and protect from free radical damage. Being a rich source of other antioxidants, mango is highly effective to prevent degeneration of the eye retina. So mango protect from cataract and macular degeneration. Mango pulp can be used to remove blackheads. For this purpose, prepare a scrub by mixing a teaspoon of mango pulp, half a teaspoon of milk or milk powder and honey. Rub this mixture all over your face in circular motion. This will help a lot in removing dead skin and blackheads. Mangoes treat acne effectively as they open the clogged pores of the skin. Once these pores are opened, acne formation eventually stops. Unclogging the pores of the skin can be an effective way to get rid of acne.Mangoes are rich in beta-carotene, which is converted to vitamin A, a nutrient that helps prevent dull skin and acne. Mango pulp can also be used externally on the skin to eliminate pimples and clear up clogged pores.Vitamin C present in mango also helps in curing pimples and acne. Mangoes are great for your skin as they have the ability to reduce dark spots, blemishes and acne, thus brings a natural glow to your skin. Vitamin A, C, E and Beta carotene in this fruit restore, rejuvenate and revive your skin with vigor as well as add natural shine to your skin. Other than bringing a glow to your face, this fruit also helps to lighten skin color and reduce dark complexion.